Alchemy Stones at the Red Dragonfly in Port Townsend! 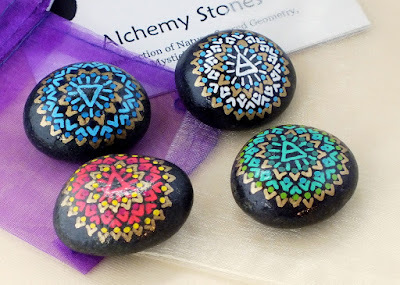 I am happy to announce that Alchemy Stones are now available through The Red Dragonfly gallery here in Port Townsend! For those who'd like to see the stones "in person," the gallery serves as a permanent showroom for Alchemy Stones and generally you'll be be able to see pretty much all the different styles I make, including petites, Faerie Stones, Chakra Stones and Chakra Stone sets and much much more. 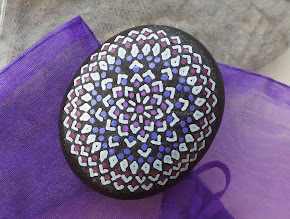 Whereas I always do my best to photograph the stones well for the online Alchemy Stone shops (eBay, Etsy and Amazon Handmade), there's no doubt that experiencing Alchemy Stones in person offers a dimension you just can't get online. Having a place to "show off" the stones also means more new ideas will be turned into reality. A recent addition to the Alchemy Stones collection is the "Altar Sets," (example pictured at left) created for those who like to take a representative sacred space with them, whenever they travel. These sets of four stones represent not only the four directions-- North, East, South and West-- but also the four elements-- Air, Water, Fire and Earth. Each set comes with a gift bag and descriptive booklet-- Sarah is working on creating "Treasure Bags" for some sets, as well. Sarah and I are continuing to develop plans for the Universal Piece Project for Peace, which will be the central part of Alchemy Stones' charity and goodwill outreach program during the years ahead. More details here as they become available. If you'd like to visit us at The Red Dragonfly gallery, it is located here in Port Townsend, Washington, in the historic "Undertown" shops, in the center of downtown. Just look for the green pergola and head down the stairs!